There are very few activities that we do not use our hands for on an everyday basis. Whether it be housework, cooking, gardening or exploring the outdoors: our hands are always needed. Hands are exposed to several environmental factors too. When dirty we wash them, which thins the skin, making it more susceptible to cracks and dryness. The skin on our hands is very thin, almost as delicate as the skin on our face! In addition, it only has a very small number of sebum glands and very little subcutaneous fatty tissue. When all these factors - thin skin, no natural moisturising suppliers as well as constantly being used in everyday life - are considered, the skin on our hands can become exceptionally dry. Hands that are not taken care of often show the unpleasant signs of aging more predominantly. When caring for your hands, consider the following: maintaining the natural protective mechanism of the skin and the prevention of skin aging, which can only be achieved when the skin is conditioned and protected on a regular basis. Thus, your hands will remain beautiful, healthy and youthful for longer. Wash your hands with lukewarm water instead of hot water. This causes less dryness. Opt for pH neutral soaps that have a similar pH value to that of your skin. This will not disrupt the skin’s acid mantle. Do not use washing agents with antibacterial additives. These do not improve the cleansing properties of conventional soaps and could lead to resistant strains of bacteria. Hands become dry, age quicker and cracks become more apparent when the skin of the hands are not cared for. This could also lead to eczema. Our diet also affects the state of our skin. Nutrients maintain the elasticity of the skin. For instance, vitamin C is required for collagen production and vitamin E helps to repair the skin. The health of our skin is therefore directly linked to diet and a healthy lifestyle. Browse through our range of natural and organic hand creams online. You are sure to find a suitable fit, like the Dr. Scheller Argan Oil Hand Cream that protects the skin from aging and offers rich, smoothing care for demanding skin types. 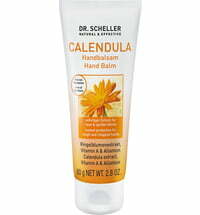 Another great choice is the Dr. Scheller Calendula Hand Balm that cares for rough and cracked skin.